The Z-Beat Zone is part of a suite of four indicators called the Z-Tools Black you can buy separately in the MetaTrader Market. The Z-Beat Zone is displayed as two lines. The main line is called SlowK. The second line, called SlowD. The SlowK line is a solid gross line and the SlowD line is a solid slim line. Buy when the Z-Beta Zone (The SlowK line) falls below of the level (e.g., -40) and then rises above that level. 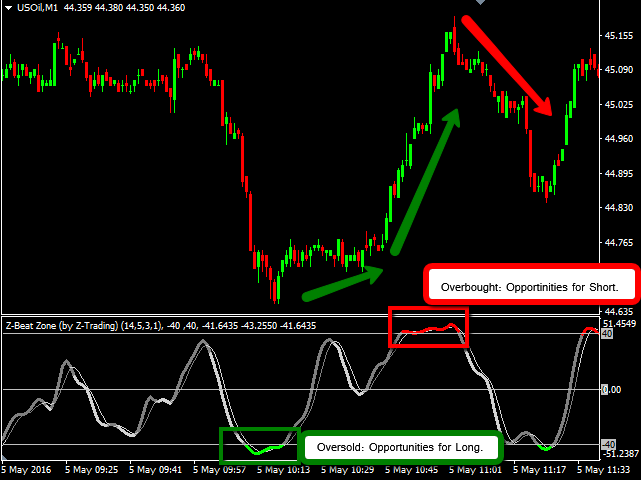 Sell when the Oscillator rises above a specific level (e.g., +40) and then falls below that level. Buy when the SlowK line of the Z-Beat Zone rises above the SlowD line and sell when the SlowK line falls below the SlowD line. Look for divergences: For instance: where prices are making a series of new highs and the Z-Beat Zone is failing to surpass its previous highs. We've improved the logic and graphic interface and we present you a Stochastic that you can use with the standard settings (14,5,3), or you can personalize. 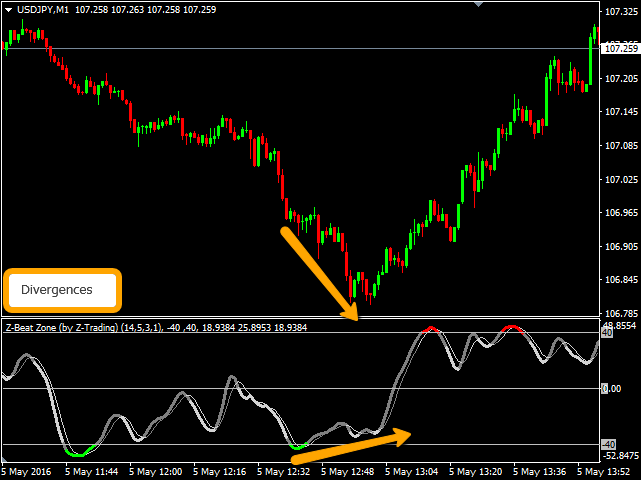 The indicator works on all time frames of the MetaTrader platform. Available: Forex, CDFs, Stocks, Futures and Commodities. StochLength: This is the number of time periods used in %K calculation. By default is 14. SmoothingLength1: This is the number of time periods used when calculating a moving average of SlowK and SlowD. By default is 5. SmoothingLength2: This value controls the internal smoothing of SlowK and SlowD. A value of 1 is considered a fast stochastic; a value of 3 is considered a slow stochastic. By default is 3. 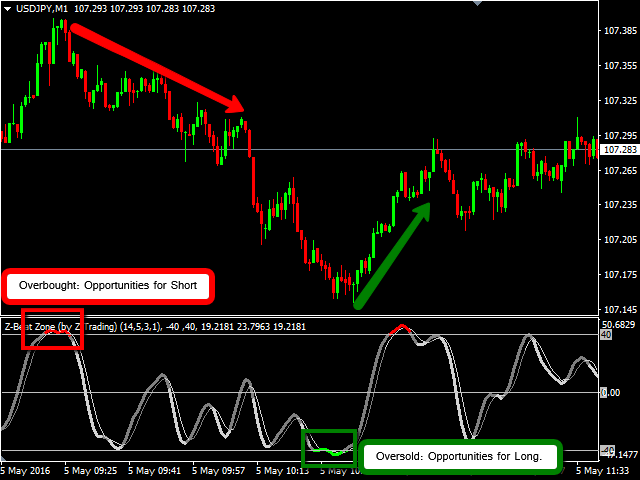 OverBought: Red --> Opportunities for Short, by default is 40. 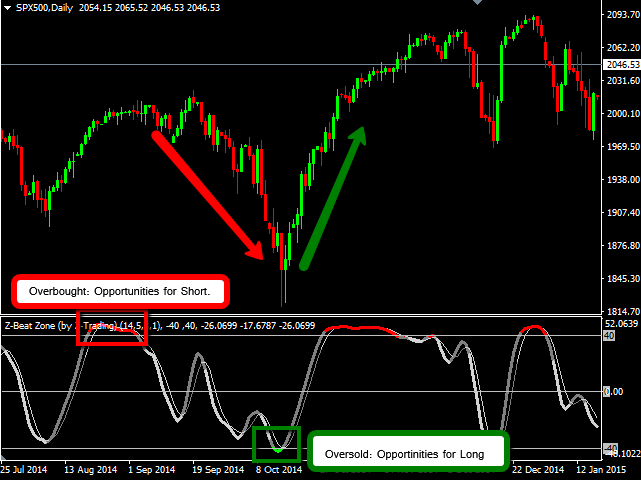 OverSold: Lime --> Opportunities for Long, by default is -40.